Lots of new screenprints released in the last few days. We have already posted the new print Dave The Chimp has just dropped with LAB. Here are a selection of some of the other prints just released. FIrst up is a new one from East London based The Krah. 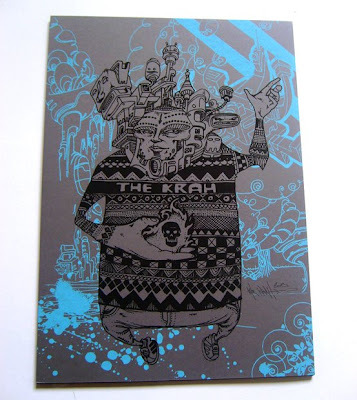 A l imited edition of just 50 these printis are available directly from the Krah for £45. Email him at: thekrahworld [at] yahoo.co.uk to find out more. Next up is a new print from Cept which has been released via Stella Dore.Hand pulled one colour screen print, printed on 250gsm cream paper. Printed, signed and numbered by the artist. The Super Villain 3 print is limited to just 20 and available for £75 from the StellaDore website. Also released today is a new Dave Kinsey print via Studio Cromie who are based in Italy. 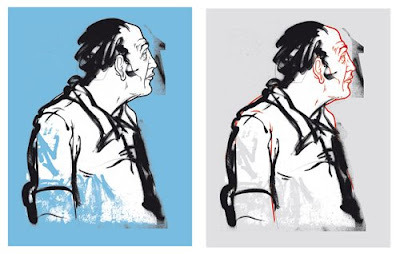 The "grottaglie" print was produced for the FAME festival ( some photos here) and is available in two colourways, one a two colour print and the other a three colour edition. See the above picture. Both are editions of 75, 50x70cms and are available for EUR 110 from Studiocromie.